Another Rip-Roaring Success at Damon Hill Karting Challenge 2018! This fast-paced charity event at Daytona Sandown Park, Esher, Surrey is a must for any karting enthusiasts, petrol heads and charity challengers alike. Teams of up to five drivers take part in a Le Mans style endurance race, enjoy the thrill of the drive and raise much-needed funds to support young people with a learning disability. Drivers will get the opportunity to meet Damon Hill OBE, patron and co-founder of the halow project, mixing alongside halow project young people, professional drivers and other business people. Cost: Team fee £800 (for a team of up to 5 drivers) - including evening BBQ, Guests are welcome to watch and join in our BBQ, evening drinks and charity raffle! Join racing enthusiasts for this exclusive event whilst raising much-needed funds for the halow project, a Surrey based charity helping young adults with a learning disability. This year’s event saw over 150 drivers take part in the 2.5-hour challenge pitting their wits against one another. As well as professional racing drivers and celebrities, teams were made up of competitive businesses & individuals. This fast-paced charity event is a must for any karting enthusiasts, petrol heads and charity challengers alike. Each team driver enjoys a briefing and practice in which they will get to grips with both the kart and the circuit. One driver from each team will then grid up and at the green light will go head to head for their stint in a full-throttle endurance race. Communication and teamwork are key, as each team must return to the pits and swap drivers midrace, just like Le Mans! The race may be won or lost in this critical handover and the team that works best as a unit will have a great advantage. Trophies will await the drivers of the three teams at a podium presentation with photos, and lap time printouts for all participants. The halow project is committed to supporting young people with a learning disability to live the life they choose as independently as possible. Today, we support some 170 young people and their families and offer a range of services which aims to help these young people on their journeys through life. 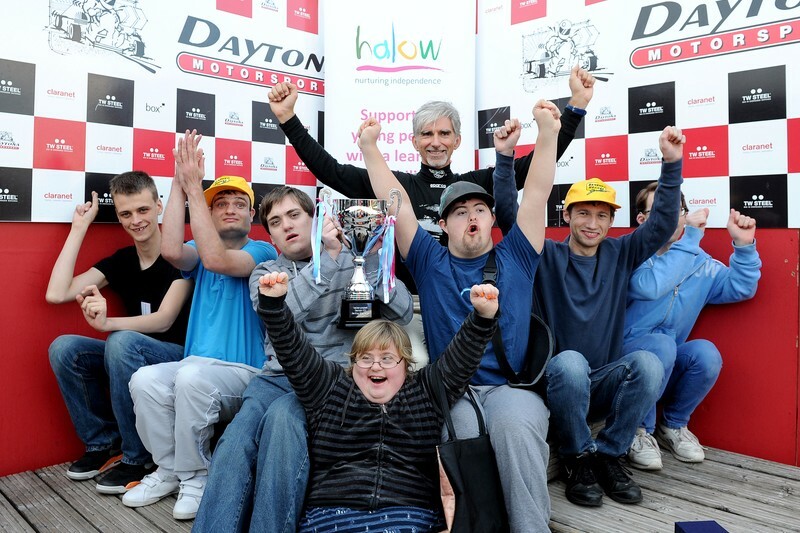 If you or your company are interested in racing or sponsoring the Damon Hill Karting Challenge 2019 please email fundraising@halowproject.org.uk to register your interest.